In celebration of its 50th anniversary, the NRAO hosted a science symposium highlighting the most important questions that can be addressed by astronomers. The universe is a unique laboratory yielding historical data on the creation of the universe, the formation of the first stars and galaxies, the production of the elements, the assembly of molecules and the building blocks of life in interstellar space, how and where planets form, and possible changes in fundamental physical constants on cosmological time scales. This "laboratory" contains black holes, neutron stars, and gravitational radiation for studying extreme gravity and extremely dense matter. It is filled with the mysterious dark energy and dark matter that control the expansion and destiny of the universe, and whole nature is a critical unsolved problem for physics. 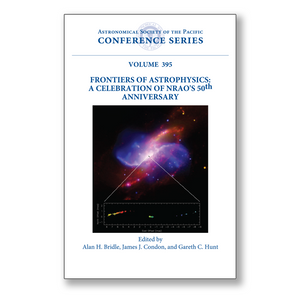 This symposium brought together leading scientists to address the most important questions in these areas, the major contributions to astronomy enabled by NRAO instruments "past, present, and future" and to suggest future directions for research involving radio observations and techniques.